This is truly a wonderful honour for me. Thank you Mr. Chancellor, Dr. George, Dean Catherine Tompkins and the entire nursing faculty. I want to thank my own friends and family, and those of the graduates, for being here with us today. And most of all, I want to thank you, the Graduating Class of 2005; I want to thank you - for going into nursing. I have been many different types of nurse in my career – a cardiac nurse, a public health nurse, a camp nurse, a nurse practitioner, and for the last 16 years I have been a Street Nurse. One of my hobbies is a collection of Harlequin style nurse books with job titles I’ve never had like “Cruise Ship Nurse”, “Peace Corps Nurse”, “Factory Nurse” and “Settlement Nurse”. Regardless of the type of nurse you choose to be, there will always be something that unites each of us as nurses. In my own career, whether I was bringing portable toilets into Tent City, or fighting for an inquest into homeless deaths, or marching in an anti-war rally calling for our government to build homes here, rather than support the bombing of them in Iraq – I was always doing nursing. I want to share with you a definition of nursing that has meant a great deal to me. I’m not exaggerating when I say that this definition, and you could call it a theory of nursing, has stayed with me every single day since I first heard it, more so than the words of Rogers, Parse, Roy, Watson or Nightingale for that matter. I don’t know who first coined this phrase but it’s the best definition of nursing I have ever heard and its only 5 words long: Nursing is attending to meaning. I’ve had many self-doubts over the years, wondering what I’ve gotten myself into, whether I’m fighting against extra-billing by doctors, or leading Nurses for Social Responsibility during the “fallout” after the Chernobyl nuclear accident, or dealing with the problem of lead pollution in South Riverdale, or the man-made disaster of homelessness. I would think about that definition, those five words, and I would always know that I was on the right track. Nursing is attending to meaning. Does that mean nursing is about the meaning of life? Well no, but it is about the meaning of living. Attending to meaning is about attending to the individual, attending to the family and attending to the community that you are nursing. What it means for the person in pain, anxiously waiting for test results or surgery. What it means for the individual and the family who lose a child or a loved one. What it means when a warehouse fire in an industrial zone spits out toxic fumes. What it means to be hungry and not have enough food money for your family three weeks of the month. What it means to be homeless, knowing it is not temporary and you will probably be homeless for another 5-10 years. What it means to give up a severely disabled daughter to the Children’s Aid Society so that she can obtain necessary care. What it means to need real choices in health care and that includes safe access to abortion. I would like to thank Dr. Henry Morgentaler for giving us that choice, and in fact, one week today, he will be receiving an honorary doctorate from the University of Western Ontario, the same doctorate that you have bestowed upon me today. Yet sadly, many of us know the meaning of being silenced. Our nursing voices are often suppressed – by doctors, by hospital bureaucracies, and by our own unpreparedness. In fact, I remember all too well, an experience I had a few years ago when I was forced to do a CBC interview on the subject of tuberculosis in the journalist’s car, in a dark alleyway instead of openly in my health centre. That experience made me really appreciate the complete and necessary role of nursing, to witness, explain, expose and tell the truth. I would like to thank the Atkinson Foundation, who gave their support to nursing when they honoured me with the Atkinson Economic Justice Fellowship last year. I’d also like to thank the Sherbourne Health Centre for giving this “homeless” nurse a base, a “home” and support to continue my work for a national housing programme. Our nursing voices are still spreading their wings and the risks to those who speak out can be real. But oh, when we do speak out, it is always a good thing. I remember RNAO speaking out on behalf of former pediatric nurse Susan Nelles who, in what can only be described as a modern day witch-hunt, was charged with the deaths of infants at the Hospital for Sick Children. I remember the Winnipeg cardiac nurses who exposed the high death rate of babies in a cardiac surgery unit. I remember the public health nurses who helped to expose lead poisoning in children. I remember the nurses who pioneered some of the cutting edge services in our country: in the free-standing abortion clinics, in the vans that took health care to immigrant women, and in the sexual assault care centres. And of course, I remember MacSOC, the McMaster University Student Outreach Clinic that, since 1999, has been bringing badly needed services to the homeless, the poor and socially marginalized here in Hamilton. Be proud that you are a nurse. You can walk into a room, a family home, a homeless shelter, a community meeting and say “I’m a nurse. What can I do to help you? – which really means what do you need, how can I support you and fight for what you need? And you can, and you will make a real difference in this world. 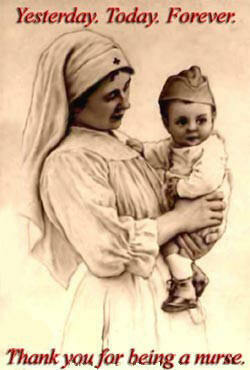 Nursing often gets described with “C” words, like caring, compassion, competent, and committed. There’s nothing wrong with those words but I tend to prefer the “P” words: power, politics, people and passion. We are nurses and McMaster Graduating Class of 2005 I am so proud to be in your company.